Mineral Writes is the collision of Brooklyn emcee Timbo King (founder of Wu Tang Affiliate ‘Royal Fam’, and member of ‘Black Market Militia’) and Richmond, Virginia-based punk rocker, Gary Llama. Their debut single is ‘See The Light’. What happened as a chance meeting turned into a melding of the minds. Two artists, taking their kids to school, meeting at a bus stop. Two artists who were looking to do something new. And from this chance encounter came Mineral Writes. In 2016, They released the single ‘See The Light’ and it’s video. They are currently working on further material. Now available on iTunes, Spotify, etc is the single from the new group, Mineral Writes, a collaboration between emcee Timbo King and Gary Llama… …check it out! 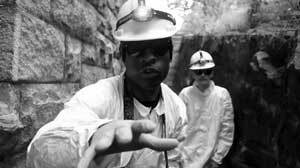 A collaboration between OVOLR!’s Gary Llama and emcee Timbo King (founder of Wu Tang affiliates Royal Fam and Black Market Militia), called Mineral Writes, released the video for their single ‘See The Light’ today… …single releasing soon!